For ideal pictures of birds you need to get eye-to-lens with your subject. For water-, shore- and ground-dwelling birds this means that your lens and camera should to be close to the ground. Because birds in general and ducks in particular are usually very skittish it is very hard to get close enough to these birds in order to make decent pictures. One of the most successful solutions to solve this problem is to use a hide. Hides come in various shapes and sizes. There are fixed hides, which on some occasions you can rent from the owner or you can erect your own hide. Usually a hide is a provisional, tentlike shelter with camouflage print in order to conceal the shelter from curious eyes. Most of these commercially available shelters are dome or tipi-shaped tents where you can place a chair in the middle and stick out the lens placed on a tripod. Such an arrangement means that the height is at least 1-1,1,5 meters where as the lens is placed at least 50-80 cm from the ground. That is fine when you want to make shots of passerine like birds in a tree or a homemade mount, but it is actually too high for low-angle shots of waterfowl. The solution I found was inspired by the hide used by military observers and snipers. Bird photographers and snipers have a lot in common so a hide used by snipers is basically very usable for photography. 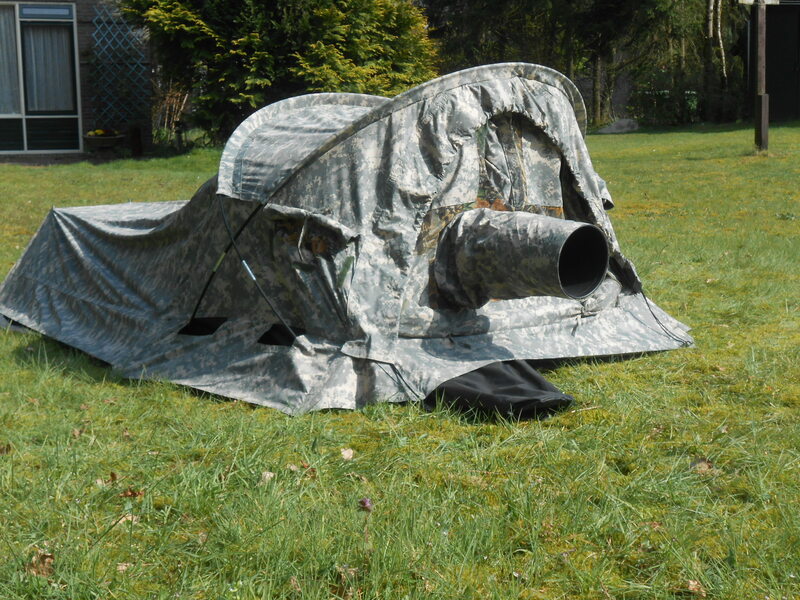 Sniper hides are made to accommodate one person and its gear, in this case a rifle. Such a hide can also be used as a shelter to sleep. 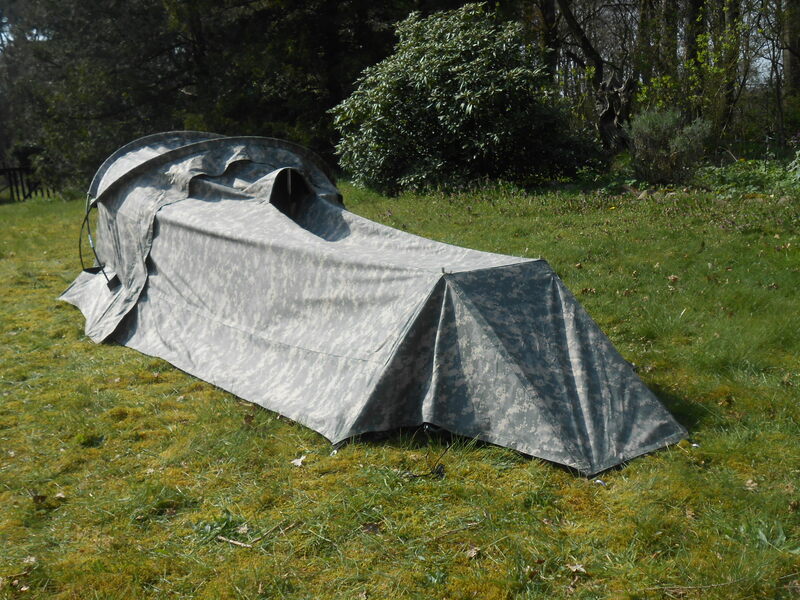 In fact the hide is essentially an extended sleeping bag with a facial cover (bivvy bag). 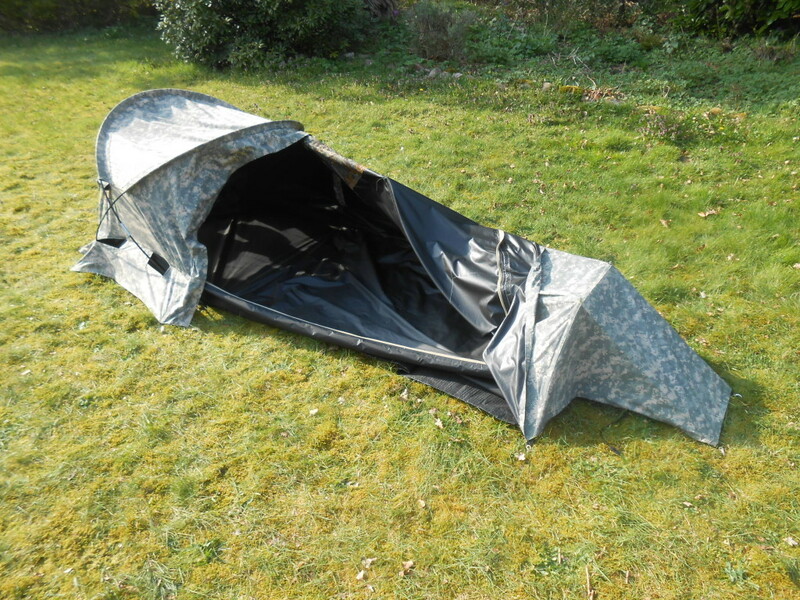 For photographic use the front end of the commercially available bivvy bags and hides are too small. Certainly if you want to use a tripod to support your lens and camera. In my case a Gitzo 5541LS tripod. 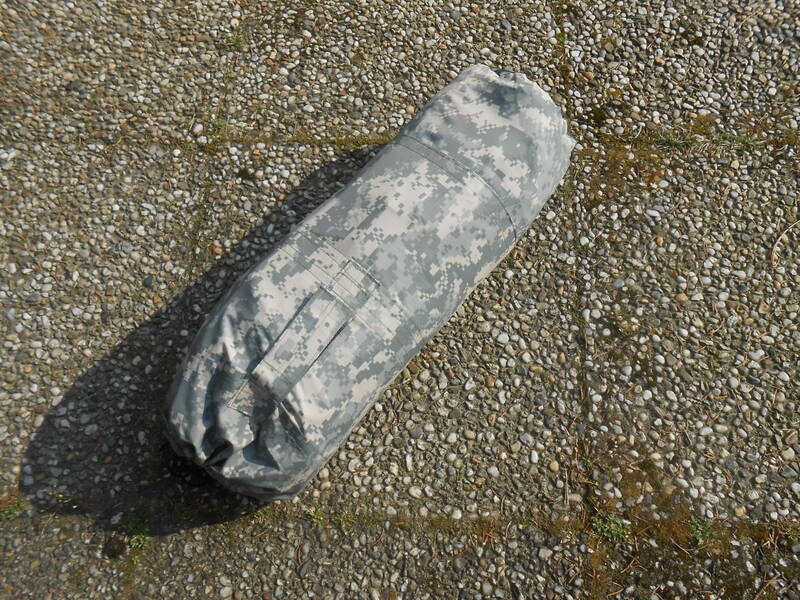 As far as I know these hides/bivvy bags are not commercially available, so I had to make one myself. The design I came up with was an extended bivvy bag with a front end specially fitted for large telelenses and no-see-um mesh. 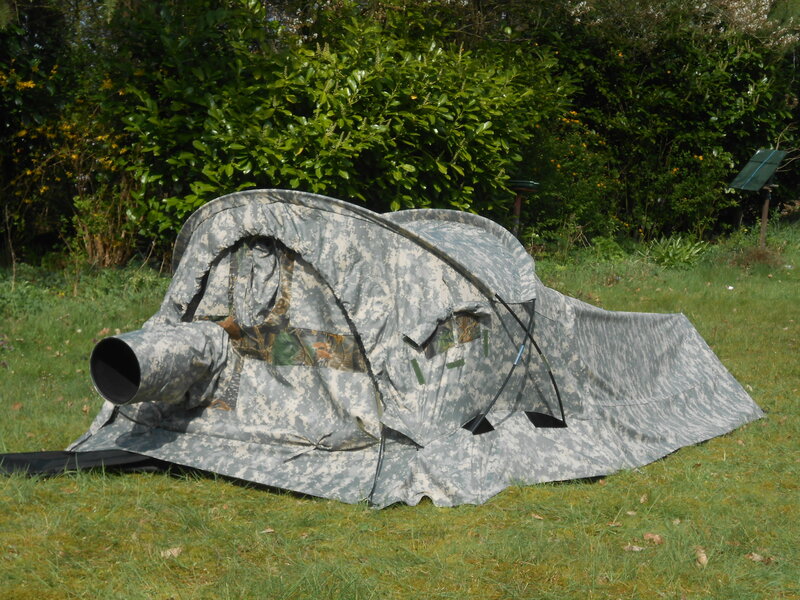 The outside of the tent is made from 98 gr/m² (2.9 oz/yd²) PU-coated ripstop nylon in UCP (digital camo) print and black PU-coated 85 gr/m² (2,5 oz/yd²) nylon (water column > 5.000 mm ≈ 7,1 psi). The inside of the ripstop nylon is coated black, ideal for a photo hide for it prevents the light from penetrating, leaving the inside obscured at all times. The camouflage pattern is mainly chosen for it’s use on sandy beaches and reed land where green tends to be absent. With the use of a camouflage net the pattern can be altered. The size of my design is 2,4 m in length, 1,0 m in width (0,75 cm at the rear end) and 0,8 m at the highest point (0,4 m at the rear end). The front part, which accommodates the gear measures an area of 1,0 m by 0,8 m. The front panel contains two snoots that were specially made to enclose the lens hood of a Canon EF-500 f4 IS L (I) lens. 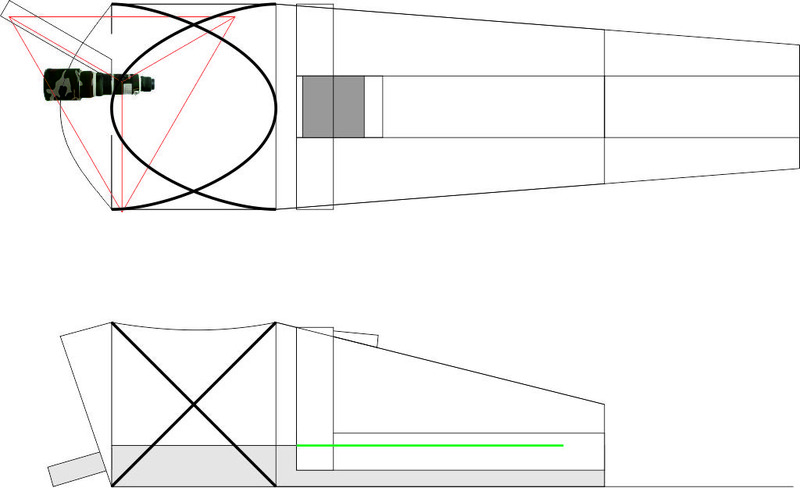 The lowest snoot is placed on the right for when the lowered tripod is placed inside the tent the central column is about 15 cm right from the center. 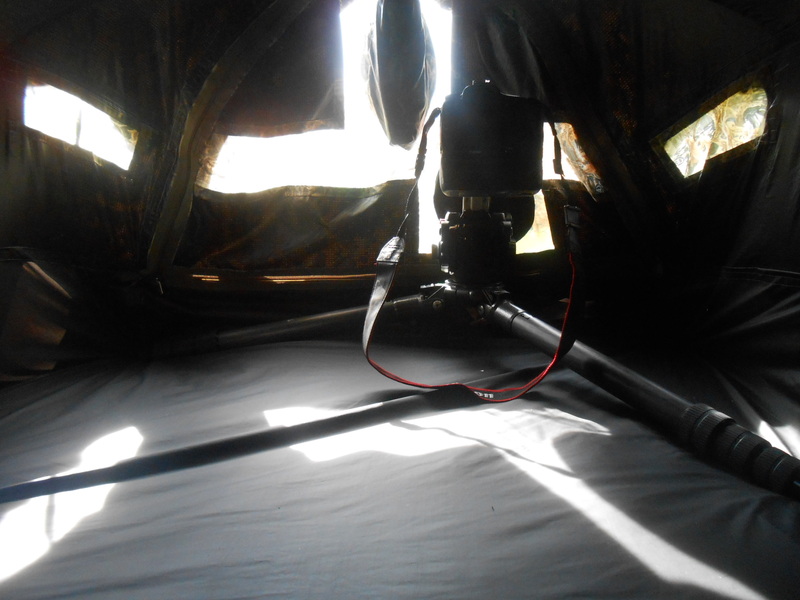 One leg of the tripod sticks out of the tent. For this purpose I fitted a special extension “bag”. Due to this placement of the tripod in its lowest position it is easy to place a sleeping bag or a cushion next to the camera gear. The snoots are fitted into a no-see-um mesh so the observer can look outside but the outsider can’t see what’s on the inside. To increase the angle of view, I fitted two small slits with no-see-um mesh on the side panels. The angle of view is approximately 240°. The original observer hides are made entirely of Gore-Tex. After the first time I used my nylon tent to sleep during the night I understood why. After a couple of hours morning dew and sweat start to condensate inside the tent. The result is a pretty unpleasant situation. For that reason I fitted a large ventilation ‘tube’ on the back of the tent, covered by a hood to prevent rain from entering. Also a ventilation panel was placed at the back end of the tent, also roofed with a cover that extends from the back panel. Both ventilation panels are made of no-see-um-mesh to prevent obnoxious insects from entering the hide. I fitted the hide with heavy duty zippers instead of the flimsy zippersusually present in small nylon shelters. The front panel with the snoots to fit the lens and the mesh, is removable. Future adjustments, other lens diameters etc, can be implemented without the need to rebuild the hide or worse, to make a new one. The poles are made of fiberglass. I bought two cheap beach shelters and resized the individual fiberglass parts that came with the beach shelters. At the back two small poles are used to raise the inside of the shelter high enough to accommodate my size 11 hiking boots. The back sheet of the hide can be used to cover a backpack, shoes or other equipment that doesn’t fit inside the shelter. In order to have a comfortable stay an air mattress and/or a sleeping bag is needed. So far I didn’t made internal adjustments to keep an air mattress or sleeping bag in position. Time will tell if such an adaptation is needed. All together, the hide, the poles ground sheet and the pegs weigh 3.19 kg. Fitted inside a bag the size is 40 cm and a diameter of 24 cm. Not exactly the Coke 2l bottle size I aimed for, but nevertheless it can be easily fitted to my backpack. When the sleeping bag and/or air mattress, tripodetc. needs to be carried as well, the entire weight on my back exceeds 25 kg. Something to take into account! Now it is time to test my design in the field.